BassBall Fever tied 5-5 this week, winning all 5 pitching categories and losing all 5 hitting categories. Jonathan Lucroy hit .429 with 4 RBIs and 9 runs scored to lead the offense. Clay Buchholz was the the pitching star with 2 wins, 13 strikeouts, a 1.06 ERA and 0.65 WHIP. Brooks Robinson came back, but still lost 6-4. Buster Posey hit 3 home runs with 4RBIs and 5 runs scored. 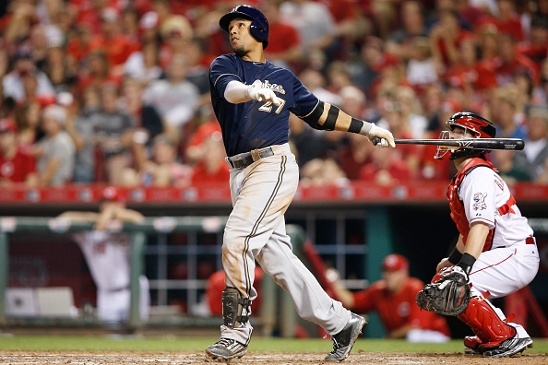 Carlos Gomez hit a grand slam, 5 RBIs and 5 runs scored. Mark Melancon had 3 saves, 4 strikeouts, a 0.00 ERA and 0.90 WHIP. The Brewers observed a moment of silence in honor of Darryl Hamilton, who was killed on June 21. Hamilton played for both the Brewers (1988, 1990-1995) and the Mets (1999-2001) as well as the Rangers, Giants, and Rockies. Carlos Gomez was back in the lineup, batting cleanup. Brewers win 3-2. Francisco Rodriguez is 14 for 14 in save opportunities this season. Jimmy Nelson went 8 innings, giving up just 1 run on 2 hits and a walk while striking out 5. K-Rod converted his 15th save of the season. Ryan Braun went 2 for 4 with an RBI and run scored and Adam Lind went 2 for 3 with an RBI. Scooter Gennett hit a home run in the 6th to provide an insurance run in the Brewers 4-1 victory. The Brewers once again failed to complete the sweep. Jason DeGrom held the Brewers scoreless in 8 innings. Taylor Jungmann pitched out of trouble all game, going 5 scoreless innings. Michael Blazek gave up a run in the 6th and Jonathan Broxton gave up another in the 7th. That was all of the scoring in a 2-0 loss by the Brewers. Paul Molitor received a large ovation as he was announced as the Twins manager in his return to Milwaukee. Kyle Lohse gave up the 18th home run of the season to lead off the game, then gave up another in the 6th. He has allowed at least one home run in 16 of his 18 starts this season. Gerardo Parra hit his own leadoff home run in the bottom of the first. Jonathan Lucroy followed that with a double and scored on a single by Braun. Twins starter out after a third of an inning, giving up 6 runs. Brewers score 4 more in the 2nd. Aramis Ramirez hit a 2-run home run, giving him 1342 RBIs as a 3rd baseman, 3rd all time behind Mike Schmidt and Brooks Robinson. Lind got his 1000th hit in the 4th. The Brewers cruised to a 10-4 win. Lohse became the 14th pitcher to beat all 30 MLB teams. Matt Garza was cruising along until the 5th inning in game 2 of the series. He got to 2-strike counts on the first 3 batters, but could not get any of them out. Torii Hunter doubled, Chris Hermann walked, and Eduardo Escobar hit a 3-run home run. Hunter added solo home runs in the 6th and 9th innings in a 5-2 Twins victory. The loss was Garza’s 10th of the season. Mike Fiers pitched 7 innings of 1 run baseball in the series finale. The game was tied in the 8th inning until Braun and Lind each hit 2-run home runs to give the Brewers a 5-1 lead. K-Rod made things interesting by giving up a 2-run home run to Hunter, but that was it in a 5-3 Brewer victory. Carlos Gomez returned to the lineup on Tuesday. Gomez was out of the starting lineup on Thursday, but came in during a double switch. Khris Davis took batting practice before the game on Wednesday and ran the bases over the weekend. He will probably be sent on a rehab assignment soon. Wily Peralta has been out since May 22 with an oblique strain. Peralta has been throwing long toss and playing catch, but he has not yet thrown off the mound. He was originally expected to miss 4-6 weeks, but that is going to be extended. He needs to throw off the mound, then build up his pitch count on a rehab assignment, which could take a couple of weeks. BassBall Fever moved into 2nd place with a 6-3 win. Adam Eaton provided the offensive spark, hitting .346 with 2 home runs, 3 RBIs, and 4 runs scored. Mike Fiers and Felix Hernandez combined for an ERA less than 2.70, WHIP less than 1.10, and 24 strikeouts. Unfortunately, neither of them got a win. Overall, the pitchers dominated with a 2.11 ERA and 0.86 WHIP. Brooks Robinson got back on the winning side, 6-4. Buster Posey was easily the offensive star, hitting .375 with a home run, 12 RBIs, and 6 runs scored. Four pitchers tallied 10 or more strikeouts. Collin McHugh had the most success with 2 wins, 14 strikeouts, a 1.69 ERA and 0.88 WHIP. Bassball Fever’s transactions: Added Kendrys Morales. Dropped Daniel Murphy. Brooks Robinson’s transactions: Put Freddie Freeman and Dustin Pedroia on the DL. Added Chris Colabello and Mike Moustakas. Darryl Hamilton was killed on June 21 as part of an apparent murder/suicide. This came as a shock to his family, friends, former teammates, and his colleagues at MLB Network. He had a 13 year Major League career playing for 5 teams. Hamilton spent parts of 7 seasons with the Milwaukee Brewers. 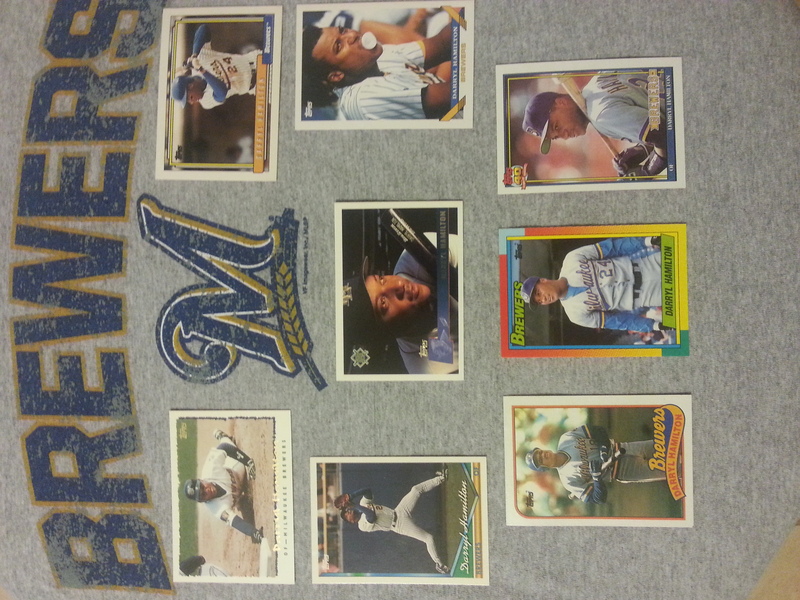 He was drafted by the Brewers in the 11th round of the 1986 draft. 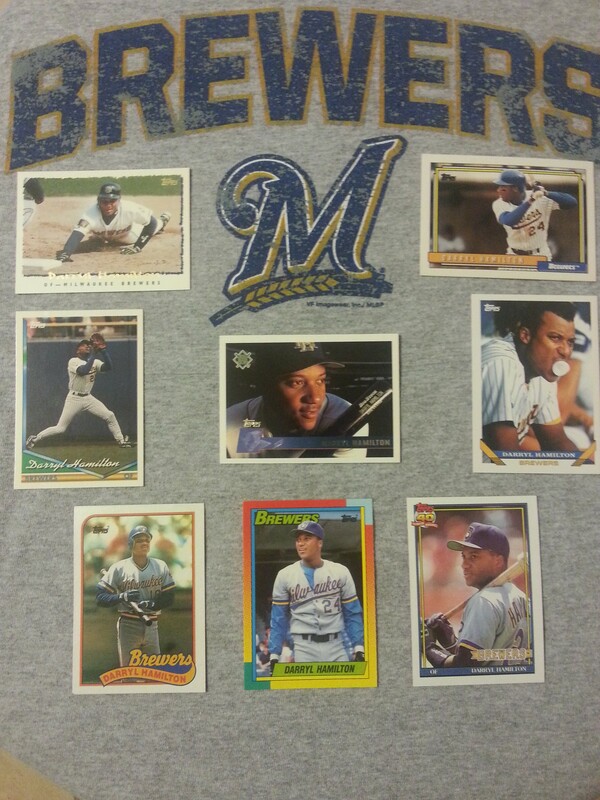 He made his MLB debut with the Brewers in 1988, playing in 44 games. He came up for good in 1990, playing in all 3 outfield positions until 1994 when he became the regular center fielder for the Brewers. Hamilton was a fan favorite in Milwaukee who always seemed to have a smile on his face. He is in the top 35 in many of the Brewers all-time statistics, including 10th in stolen bases (109) and 5th in batting average (.290). He was a solid defensive outfielder who finished first in his league in fielding percentage 4 times. He currently ranks 6th in career fielding percentage for outfielders in all of MLB. Hamilton signed with the Texas Rangers in 1996 as a free agent. He was their starting center fielder and leadoff hitter and led the Rangers to their first ever post season series. The Rangers lost the division series in 4 games to the New York Yankees. From there, Hamilton went on to play for the San Francisco Giants, Colorado Rockies, and New York Mets. He played in the postseason with the Giants in 1997 and the Mets in 1999 and 2000. The 2000 Mets went to the World Series but lost to the Yankees. The Brewers observed a moment of silence in Milwaukee before the game against the Mets on June 22. The Rangers also observed a moment of silence before their game against the Oakland A’s. Hamilton was a popular player among his teammates and fans. He will be missed. Rest in peace. BassBall Fever won big this week and moved up to 3rd place. Brooks Robinson lost big, sinking further into last place. BassBall Fever won 8-2. Steven Vogt hit .458 with 2 home runs, 11 RBIs, and 4 runs scored. Alcides Escobar hit .393 with 8 RBIs, 5 runs scored, and 1 stolen base while Mike Moustakas hit .391 with a home run, 7 RBIs, and 5 runs scored. Max Scherzer again flirted with a perfect game, and the hit by pitch does not count against the WHIP, so he may as well have been perfect, getting the win, striking out 10, and posting a 0.00 ERA and WHIP. Mark Melancon added 3 saves with 3 perfect innings. Bassball Fever’s transactions: Added Delino DeShields to the DL. Added DJ LeMahieu. 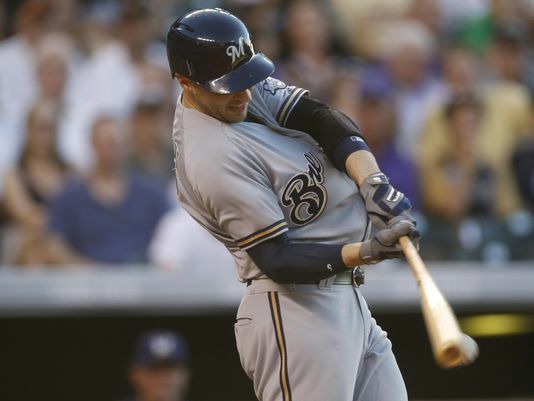 The Brewers opened the four game home-and-home series against the Royals with an 8-5 loss. The Royals jumped on Kyle Lohse for 3 runs in the first and added 2 more in the 5th. Jonathan Lucroy hit a 2 run double in the fifth and another run scoring double in a 3 run 9th inning that came up short. Game 2 did not go any better as Matt Garza gave up 6 runs in 6.2 innings. Lucroy had another RBI in the 8th and Scooter Gennett hit a solo home run in the 9th, but it was too little too late. The change of venue did not change the outcomes between these two teams. The Brewers took the early lead on Gennett’s run scoring triple in the 2nd inning. The Royals came back with 3 runs in the bottom of the inning, then scored 3 more in the fifth. Mike Fiers gave up all 6 of those runs and Jonathan Broxton gave up 4 runs in the 8th in the 10-2 loss. Once again, the Royals jumped out to an early lead, scoring 3 runs in the first 2 innings. And once again, the Brewers were not able to come back. They made this one close, scoring 2 runs in the 5th, but not scoring any more. The Brewers lost their 6th game in a row, 3-2. Ned Yost became the Royals’ winningest manager with his 411th win. The Brewers’ bats came alive early and often in Colorado, leading them to a 9-5 lead. Ryan Braun hit a 2 run home run and Aramis Ramirez added a solo shot in the 1st. The Brewers had a 6-0 lead in the 4th when the Rockies scored 3. The Rockies tacked on another run before the Brewers scored 3 more times in the 7th. The bats cooled off again in game 2. Lohse had a better game, but he still gave up 3 runs and took his 9th loss. Adam Lind hit a solo home run in the 6th, but that was the only run scored in a 5-1 loss. Matt Garza gave up 10 runs, 7 earned, in 5.1 innings as the Brewers lost again. The Brewers scored a run in 2nd, 4th, 6th, and 8th, but they gave up 3 in the 3rd and 4th and 4 in the 6th for a 10-4 loss. Carlos Gomez missed all 6 of the 7 games this week after playing in the final 2 games against the Nationals. He was the DH in Wednesday’s loss to the Royals. The Brewers are expecting him to play against the Mets after an off day on Monday.